Protestors are being arrested who failed to leave the freeway. Police arrest protesters who do not leave the freeway during a protest after officer Yanez was found not guilty. 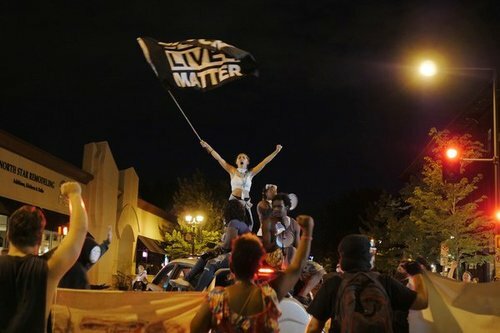 Eighteen people were arrested after a march that blocked Interstate 94 in St. Paul late Friday night and into early Saturday morning. Marchers were protesting the acquittal of a police officer who shot and killed a black driver. A Ramsey County jury found St. Anthony police officer Jeronimo Yanez not guilty on all three charges against him related to the traffic-stop death of Philando Castile last July. The charges included second-degree manslaughter and two counts of felony discharge of a firearm, for endangering Castile's girlfriend, Diamond Reynolds, and her four-year-old daughter, who were in the car during the stop. 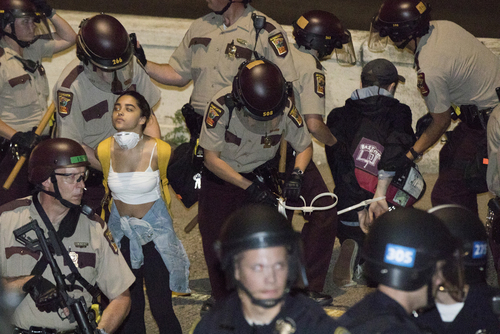 Minnesota State Patrol spokesperson Lt. Tiffani Nielson said in a news release Saturday that officers began arresting protesters at 12:30 a.m. after issuing three warnings for them to get off of I-94 in St. Paul. She said those arrested were booked at Ramsey County Jail on charges including being a pedestrian on the busy freeway. Three and a half hours after the verdict was announced Friday afternoon at the Ramsey County Courthouse, hundreds convened at the Minnesota State Capitol just a mile across town to show support for the Castile family in a protest and vigil. "I'm paralyzed by the spirit of the verdict," said Pastor Danny Givens, a clergy liaison to Black Lives Matter Minneapolis, told the crowd. "I can't find words. I'm not surprised but I really just can't find the words." From the capitol, marchers moved down University Avenue, where they blocked Green Line light rail trains along the way and interrupted service for about an hour. Protesters then marched through St. Paul streets — past the funeral home where Philando Castile's body was carried to his memorial; near the elementary school where he worked in the lunchroom; and through part of the neighborhood where he grew up. They moved on to I-94 in the late hours of Friday night, blocking both east- and westbound lanes. Just after midnight, the State Patrol estimated there were 500 protesters on the interstate. After police issued warnings, most moved from the freeway to the frontage roads to cheer on the small group that remained to be arrested. The freeway reopened around 1:30 a.m. after the State Patrol and St. Paul police moved the last protesters off the highway. About 250 people march from St. Anthony Police headquarters down Silver Lake Road, chanting “No killer cops, no KKK, no racist U.S.A.” on June 18, 2017.